Long hunting seasons and time spent afield either in poor weather or overly hot conditions can wreck your trusted field friend by accelerating the development of unwanted corrosion. When powder is left to build up, gunk can cause your equipment to misfire, fail or even lose accuracy. Hunters usually don’t notice this corrosion or gunk until the minute it counts—an animal is in sight, the failure occurs and the trophy runs away. So the question is, with so many brands and choices, how do you choose a total gun care solution that will work best for your hunting and shooting needs? First, choose a reputable brand that has been around for many years. Products come and go in this category if they don’t work, so choosing a solid brand ensures that you are choosing products that actually work. Your focus should then be on four criteria: ease of use, time savers, performance, and quality. Your gun care products should be able to quickly remove the “easy to procrastinate” job of cleaning your gun without multiple attempts and repeated applications. If too much time, unpleasant odors or mess are involved, you will probably choose to “get to it later” and ultimately regret that decision when your new rifle or shotgun bluing becomes pitted from sweaty finger prints or rust attacks your bore. *ALWAYS be certain the firearm is completely unloaded before cleaning. Safety always comes first before gun care. Start with the simple stuff—the outside of the firearm. If you have not shot your firearm and are just running a check on how it’s holding up in the case, a quick and easy wipe down with a treated gun cloth that has corrosion inhibitor will protect your investment in a snap. There are also pre-moistened disposable wipes available that lubricate and help prevent rust for a quick wipe-down on your way out of the field. Some of these products even penetrate into small pores of the metal for additional protection. When focusing on ease of use, also consider all of the different packaging methods and delivery methods that exist. Liquid cleaners or lubricants are great. Tip on liquids: always look for a no-mess nozzle applicator. They are not only helpful in preventing waste and accidental spills, but also allow you to get some pinpoint placement on specific parts that may be hard to reach. Aerosols are great because they quickly coat multiple gun parts and get into small or difficult-to-reach areas. The pressure of an aerosol also helps to blow out unwanted debris. And keep container size in mind, especially for the gun case, when traveling or in your field pack. It’s great to have a smaller size cleaner/lubricant in all these places, “just in case.” Save the big economy sizes for the workbench. Also look for gun care chemicals, patches or patch substitutes that don’t involve overly complicated processes and added steps. Keep it simple, but never be afraid to explore new innovation because gun care is definitely something that doesn’t have to be done the way grandpa did it. The most critical parts of your gun that need cleaning are the parts that you can’t see—the bore and the chamber. When caring for the bore, take the time to identify a product that is aggressive on dissolving carbon powder residue as well as removal of the fouling in your rifling. Copper and lead fouling will not only fill the rifling, causing a loss in accuracy, they will also attract moisture which will cause corrosion, pitting and eventual damage to the bore. New muzzleloader hunters should remember that plastic fouling from sabots will also fill the lands and grooves causing a rapid decrease in accuracy. Many bore cleaners exist that attack all of the above fouling types. A solid first step to tackling this is to apply the bore solvent to a patch (or brush) and scrub out your bore with either a bronze brush or hard nylon brush while allowing the chemical time to do its work. Follow these brushings with either more wet patches or one single pass of the innovative Remington Squeeg-E to remove the solvent and debris. Repeat until clean. Once the barrel is clean, dry it with a patch or two, then run a clean, lightly-oiled patch down to coat the barrel and prevent corrosion. It’s always a good idea to wipe this oil out with a dry patch just before shooting. When cleaning a trigger group or action, a good action cleaner or shotgun cleaner will do the trick. These products are meant to easily dissolve powder residue, dirt and caked-on lubricants that will interfere with the proper functionality of the firearm. A product that dries quickly and laves no residue is preferred. Follow up with a light lubricant. Shotgun cleaners are more specifically geared towards trigger groups, gas ports, choke tube threading and magazine tubes. Again, aerosols are perfect in such applications to blast away gummy, caked-on grime from hard-to-reach areas such as ejectors, firing pin assemblies, trigger components and bolt recesses. The Modern Sporting Rifle (MSR) user should look for a good clean, protect-and-lubricate (CLP) type product that is designed for these high temperature and high cyclic actions. Hunters who are operating under extreme cold conditions should look for a dry lubricant that is formulated for protecting your firearm’s trigger group and action in sub-zero temperature (-40 F) while also offering superior lubricity without leaving any dust-collecting residue behind. Complete gun care kits can be found at your favorite sporting goods store that contain all the components and chemicals you need in one convenient package. Multiple bore brushes, cable lengths, rods, chemical bore cleaners, lubricants and even bore lights, cleaning mats and take-down tools are often combined into one convenient range bag or pouch. When storing your firearms, remember to inspect them periodically. It is a good idea to fresh up the anti-corrosion properties by reapplying a new coat of lubricant every 6-8 months. For long-term storage, use a dehumidifier or desiccant as an added guard against moisture in your safes or gun cases. Remember that there is a regimen to cleaning your teeth after eating or to changing the motor oil as it breaks down in your vehicle. You should also keep to a similar practice and clean your firearms after each use and especially before any long-term storage. 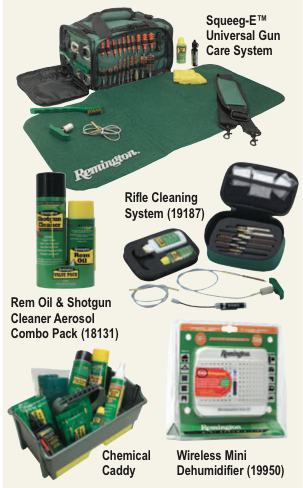 For additional information on gun care products, visit www.shopremingtoncountry.com to view innovative solutions that are available in firearms maintenance. Remember to be safe, to keep it clean, shoot straight and to get out there hunting and shooting often.